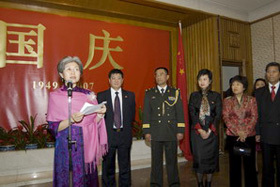 In the evening of September 25, 2007, the Chinese Embassy in the UK held a Reception for overseas Chinese in UK in celebration of the 58th Anniversary of the People's Republic of China. Nearly 400 representatives of the overseas Chinese in UK were present. The reception began with chorus of the national anthem by all participants and the atmosphere was lively. H.E. Mme. Fu Ying delivered a speech and extended the warmly greetings and good wishes to the overseas Chinese and overseas students in UK. Fu Ying noted that the People's Republic of China had made great achievements since it was founded 58 years ago. China is getting rid of poverty and backwardness and is developing into a well-off big country. At present, China is No. 1 in foreign exchange reserve, No. 2 in R&D input, No. 3 in foreign trade and No. 4 in GDP in the world. According to the latest forecast, China is contributing 16% of the world economy growth surpassing USA for the first time. Fu Ying said that a lot of great, grand and happy events happened in China this year, China celebrated the 10th anniversary of the handover of Hong Kong, the 80th anniversary of the founding of People's Liberation Army and the 20th anniversary of the resumption of the exchanges between the two sides of the Taiwan Straight. The 17th CPC National Congress will be held soon, which will put forward new ideas and layouts for the development of the next stage. The preparation for the Beijing Olympic Games has entered the final stage. China will hold the three great sport events, namely the Special Olympics, the Paralympic Games and the Beijing Olympic Games in succession in the coming 12 months, which attracts the attention of the whole world. Fu Ying introduced that this year is the 35th anniversary of the establishment of Sino-UK Ambassadorial diplomatic relations and the leaders of the two countries exchanged messages of congratulation. She noted that the Sino-UK relations is at the best historical phase, the high-level exchanges of the two sides were frequent, Prime Minister Brown had a telephone conversation soon after taking office and the two advisors of the Prime Minister just visited China. Bilateral economic exchanges are vigorous. At present, to increase export and encourage domestic enterprises to go abroad have become the new emphases of Chinese policies, there are great potentials for cooperation between China and UK in such fields as environmental protection, low carbon and clean energies. Fu Ying said that more and more UK people were paying attention to China and keen to know China. The opening of the Exhibition of First Emperor: China's Terracotta Army was an exceptionally grand occasion. Prime Minister Brown opened the exhibition, he said that day was a great day and it was a good proof for the increasingly close friendship and cooperative relations between the two countries. 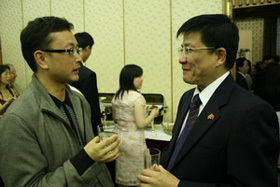 UK will hold the large-scale serial activities named "China Now" in 2008, which would be a good platform for promoting bilateral cooperation and would further strengthen the exchanges and understandings between the two peoples, Fu Ying hoped that overseas Chinese in the UK got more actively involved in "China Now". Fu Ying emphasized that it was an important task at present to fight against the "Taiwan secessionist". The overseas Chinese in UK held a symposium not long ago and expressed the aspiration of the broad overseas Chinese against "Taiwan secessionist". The Chinese Embassy in the UK also received all kinds of good ideas and suggestions from the overseas Chinese recently. Fu Ying said that she believed the realization of the unification of China was the unanimous wish of the Chinese nation and she hoped that all overseas Chinese in UK could continue to take a clear stand and do more work to fight against "Taiwan secessionist" and promote the unification. Fu Ying noted that day was also the traditional Mid-Autumn Festival of China and she was happy to celebrate the festival with the overseas Chinese in UK. It is said that "the moon is the fullest at home" and the feeling was especially shared by overseas Chinese in UK. Fu Ying wished the participants happy Mid-Autumn Festival, harmonious family and prosperous business. The broad overseas Chinese in UK are proud of the prosperity of China and they are full of confidence in the future of China, they noted that they would support the development of China as usual and make positive contributions to the earlier peaceful unification of China. 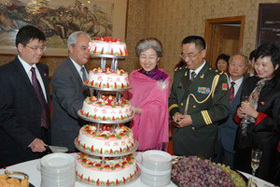 In the reception, Fu Ying cut the birthday cake for the 58th Anniversary of the People's Republic of China with the participants and they wished the prosperity of the motherland together. After the reception, Fu Ying gave interview to the Chinese media in UK and talked about the Sino-UK relations, the economic and trade cooperation between the two sides and the quality of the products exported by China.